ProfesionalHosting Review 2019: Is ProfesionalHosting a Good Hosting? ProfesionalHosting has been in the website hosting business in Spain for over 16 years. The vendor might be a perfect fit for any business looking for a CMS-optimized hosting service. ProfesionalHosting is a small Spain-based web hosting solutions provider that specializes in CMS hosting. The vendor also has market shares in Mexico, Belgium, Argentina, and Colombia. ProfesionalHosting has been providing web hosting services to individuals and businesses in Spain since 2002. They’ve been growing steadily over the years, eventually adding VPS hosting and dedicated server hosting to their range of hosting solutions. 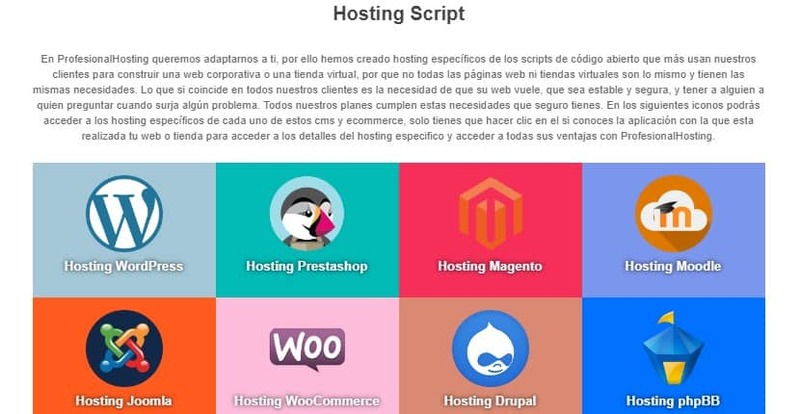 The ProfesionalHosting website is available in Spanish, with certain sections also available in English. For any small business looking for a hosting vendor that has plans specifically optimized for various CMSes, ProfesionalHosting might be your best bet. They’ve employed the use of CloudFlare’s CDN technology to improve the loading speeds of all websites hosted on their servers, and they’ve configured their system to automatically update every CMS to ensure that no known vulnerabilities of older versions can be exploited. For users who need to migrate their websites from their previous hosting providers, ProfesionalHosting offers free migration services for as many as ten domains. The ProfesionalHosting servers that serve their European customers are located in Madrid, but the vendor also has other servers in the U.S. for their Latin American customers. ProfesionalHosting doesn’t readily advertise any uptime guarantees or SLAs on their website, unfortunately. Compared to other hosting vendors in Spain, ProfesionalHosting’s plans are priced a little on the high side. Their entry-level shared hosting plan starts you off at 3GB SSD storage and unlimited data transfer, which means that while they do offer good value, they don’t have any lightweight plans available for those who only want a basic, largely-static website. However, they do boast a considerably long list of features for the prices they charge, so all in all, their plans provide decent value for money. ProfesionalHosting offers all their customers 24/7 tech support via tickets. Alternatively, you can also contact them through their live chat, phone, and email, although these are only open during extended office hours. What’s more, this vendor’s support team can use TeamViewer to connect to your PC remotely and offer assistance. This shows the vendor’s commitment to solving client issues in the shortest time spans. ProfesionalHosting also has a forum available and a fairly detailed knowledge base to help users understand and make the most of the hosting solutions they provide. I also liked this company’s decision to include in their knowledge base several courses for free, including a PrestaShop and WordPress course. My personal interactions with ProfesionalHosting’s support team was quite pleasant, confirming the vendor’s claim that they offer high quality support. The staff member I spoke to quickly grasped the issue I needed help with and gave me easy-to-understand instructions on how to solve the problem. As a small hosting brand, ProfesionalHosting is able to concentrate their resources and expertise on helping their customer base with personalized hosting solutions at affordable prices. The vendor is a good option for small businesses in Spain and Latin American countries. Wondering how ProfesionalHosting stacks up against other Web Hosting companies? Enter any other Web Hosting company and we will give you a side-by-side comparison.